For an anime about schoolgirl rockers, one thing is more important than all others: the music. 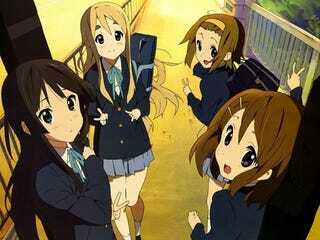 And animated series K-On!! has just that, good music. The show's season season opening tune "Go! Go! Maniac" hit number one in the Japanese music charts, selling over 83,000 copies. And coming in the number 2 spot is K-On!! 's ending theme "Listen!! ", which sold 77,000 copies. This is the first number one album by anime characters. Previous K-On! tunes, season one opening theme "Cagayake!GIRLS" and ending them "Don't Say 'Lazy', charted at number 4 and number 2 on the Japanese charts. Website Tokyograph points out that the last female singer to achieve the top two singles in the same week was "eternal idol" Seiko Matsuda in 1983. Matsuda, who is viewed as a national treasure of cute in Japan, is perhaps best known to Western audiences for her duet "The Right Combination" with New Kids on the Block singer Donnie Wahlberg. As with most popular anime and manga, K-On! are getting the inevitable video game adaptation.